Mulch that touches the tree trunk invites decay and pests and can kill the tree. The common effects of mulch heaped against a tree trunk include wood rot (likely to cause the tree’s death), girdling roots, and failure to develop a normal root flare (tree is less stable and more likely to fall during a storm). 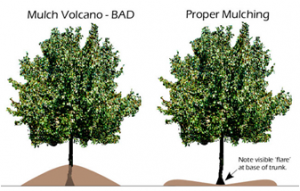 Mulching is beneficial for trees when applied 2-4 inches deep to the drip line and away from the trunk — or by the “3x3x3 rule” of 3 inches of mulch, 3 inches from the trunk, in a circle 3 feet wide – so that wood chips, bark pieces, or other natural mulches form a flat donut with a tree in the center. The tree benefits from moisture retention (especially beneficial in warm weather), improved soil (as the mulch decomposes), and insulation against heat and cold.